So how can we use it? We can operate the sound module using an externally connected device like a MIDI controller. Amongst all the controllers, musical keyboard always wins the race. But that doesn’t make other controllers like wind controllers, guitar controllers, and electronic drum pads weak. They use plenty of technologies to produce their sounds. Here, we are going to talk about some fantastic piano sound modules. Roland is an old school sound module, able to make us feel nostalgic. The company released it in 1987, and since then it is trying to stay the best as it was at that time. It includes a lot more stuff than just being a device. If you don’t believe the company or us, check out these features. The DCB, i.e. Digital Circuit Behavior covers each detail nicely. It is the perfect sonic recreation of the D-50 from the inventors. It includes an authentic user interface with the joystick control. It has all the original presets and also includes some fresh sounds. It helps to define the synthesized sustaining waveforms from the late ’80s till now. It also includes a built-in chorus, reverb, and EQ. Its construction with metal front panel is portable and easy to process. It runs with the 4 x AA batteries or USB. It has built-in powered mini-speaker for instant enjoyment. It can generate classic tracks. We can also listen to countless film scores and other genres like synth pop, new jack, R & B, etc. Ever wanted to convert your MIDI controller into a stage piano, without any restrictive wires of the laptop or computers? Then the M-Audio accent module is the best choice for you. This device is compact and portable. We can connect it to any USB or 5 pins MIDI controller. For more details, read further. It includes the famous AIR Steinway piano and AIR structure samples. The weight of this sound module is only 3.6 lbs, and power is 12 Volts. It also includes ¼” Headphone output for silent practicing. It has 32 preset locations in which 21 to 32 are blank. First 20 preset locations are soothing sounds of piano, clavinet, clean organ, synth bass, drums, percussion pad, etc. It comes with the 20 built-in voices with the ability to split more than one (up to three) different sounds simultaneously. The kit includes accent module, power adapter, user guide, and warranty manual. It also has a safety manual in it. Technically, it has a USB port, MIDI in, main out, aux input, and a Kensington lock to the excess module. 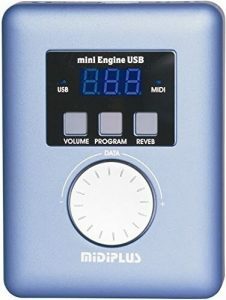 If you compare the prices of products, you will find out that the Midiplus miniEngine is the cheapest amongst all. Still, it offers the same sounds, same features, and the same functionalities as other expensive modules. Newbies and hobbyists prefer it more because of its low price and convenience. It is a unique design working as a USB host. The user can connect it to any USB MIDI keyboard directly. Just like some expensive modules, we don’t need to connect this piano sound module to any computer/laptop to get sounds. It includes 128 GM built-in sound with a maximum polyphony of 64 notes. Even in this cost, it includes 3.5 mm TS to MIDI cable, micro USB cable, and an owner’s manual in the package. It is one of the smallest MIDI sound modules around the world. It’s just like a pocket diary which we can carry in our hands too. It contains a 2500 mAh rechargeable battery inside and when needed, we can convert the sound module into a mobile charger! Isn’t it best nowadays? Roland JP-08 is a limited edition piano sound module that played almost everything in n numbers of recording during the ’80s. Most famous synthesizer Jupiter 8 recreates the warm and rich tones via ACB modeling technology. In the simplest term, we can say that it is a digital version of the Jupiter 8. Roland JP – 08 is capable of handling the market demands, whether it is for the stage or studios. Nothing else can beat this module when connected to a good MIDI keyboard. It has eight patches presets. It has 36 knobs and sliders. It can be used as a 24-bit/44.1kHz USB audio interface. It includes the ribbon controllers for pitch bend and modulation, and it can chain more than one modules together for the maximum polyphony of 4 voices. There is a built-in mini speaker. We can operate the sound module by the battery or USB. It can benefit the user with increased LFO waveforms and VCO range with the 16 pattern step sequencer. JP – 08 is a versatile sound module that has its beautiful effects and great sounds. The Yamaha Motif Rack XS is a fully-featured sound module. It is a complete package which comes with a wide range of voices. It is one of the best piano sound modules, with some traditional bass, guitars, and drums sound modules. For a professional, this little piece is a significant reason for happiness. Motif Rack XS includes a wide range of traditional voices. To be very precise, it comes with the 1152 sounds and 65 drum kits. It offers powerful Arpeggio function including 6633 different arpeggio types. It has 160 x 64-dot graphic backlit LCD and an AWM2 tone generator with Expanded Articulation. This device includes 128-note polyphony, 2670 waveforms, and 128 Multis. Apart from that, it benefits in reverb, chorus, and EQ, etc. Most of the professionals love it. Either you are a hobbyist, newbie, or a player, Yamaha Motif Rack XS is undoubtedly preferable to you. It has a wide range of quality sounds, straightforward user interface, and quality build. As its price is a bit higher than the other sound modules, it is much more popular within the pro players. So, these are our top five! Give us a virtual high-five if this article is useful to you. We hope that you have found the best piano midi sound module for you. If you ask us, the Yamaha Motif XS stands well. But if you don’t want to spend that much amount of money, you can also try Roland Sound Module D-05 or Roland JP-08 as they are equally reliable options.